A suspenseful running of the men’s 500m concluded yesterday with 21st-birthday-boy Mo Tae Bum being the only person to go under 35 seconds on both runs. After a long delay due to a broken down ice resurfacing machine halfway through the first run, they were finally able to get under way. At the end of the first run, Finland’s Mika Poutala was in the lead, with Mo, Joji Kato of Japan, and another Korean, Lee Kang Seok following closely behind. Canadian favorite Jeremy Wotherspoon was well-placed in fifth. The second run saw a lot of see-sawing with positions and times which had Mo emerge victorious, with Japan’s Keichiro Nagashima advancing from 6th to 2nd and Joji Kato treading water in the bronze medal position. The ladies’ 500m will be a closely contested race between Beixing Wang of China and Jenny Wolf of Germany. Wolf is on form having broken her own world record only last December, while Wang, on the very next day, broke her Chinese national record, lowering the mark to 37.03 seconds (Wolf’s world record is 37.00, and the old record was 37.02). The close scheduling of the two runs (closer if an ice surfacing machine happens to break down) may be a deciding factor. Typically Wolf is a 500m specialist, struggling to even keep the pedal all the way down for the full 500m, while Wang is also proficient in the 1000m. 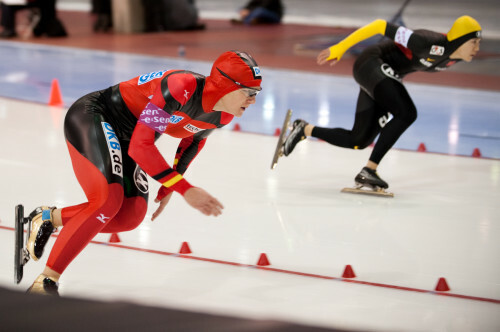 For this reason, I’m predicting that Wolf will skate the fastest time of the day, but Wang will win when the aggregate of the two races is added (which, incidentally, is how the medals are decided). The race for third will be close. The Netherland’s Annette Gerritsen had a strong start to the world cup season, on the low-altitude venues. Recent form is with Lee Sang Hwa of Korea and Nao Kodaira of Japan, and the way the Koreans have been going I might just tip Lee for the bronze medal. Outside chances also exist for Margot Boer of the Netherlands, as well as Yulia Nemaya of the Russian Federation, both in the last pair. Also be on the lookout for Sophie Muir from Australia – first Australian long track speed skater for 16 years, and first female australian long track speed skater at the Olympic Games ever. She will be looking for a top-20 placing. One can only hope that the ice resurfacing machine doesn’t die… third day lucky I suppose.